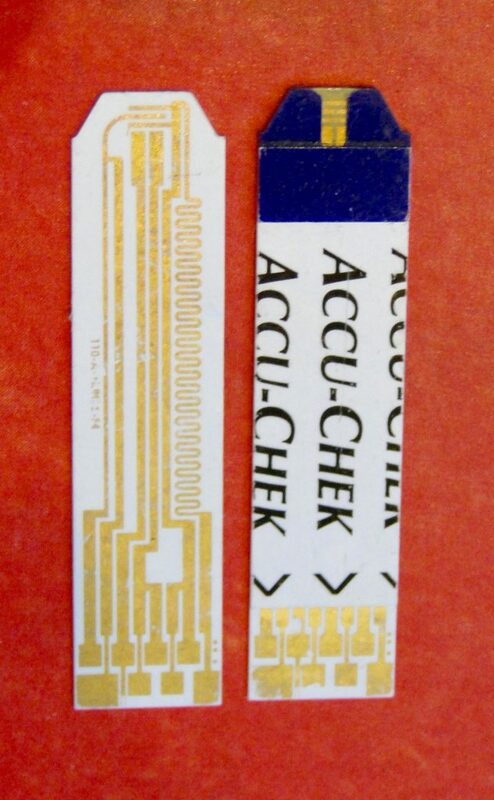 The labyrinth of foil inside a glucometer strip reveals a fragile chemistry. If you peel open the plastic covering, many inner circuits contain some version of biosensor technology, electrochemical cells screen-printed with gold or other precious metals and coated in places with enzymes. The foil serves as a conductor for electrons in a drop of blood, allowing a brand-matched glucometer machine to measure the charge a sample holds. Yet costly design components (including gold) are also part of the reason that glucometer strips remain too expensive for most people in the world who have diabetes. Fig. 2. 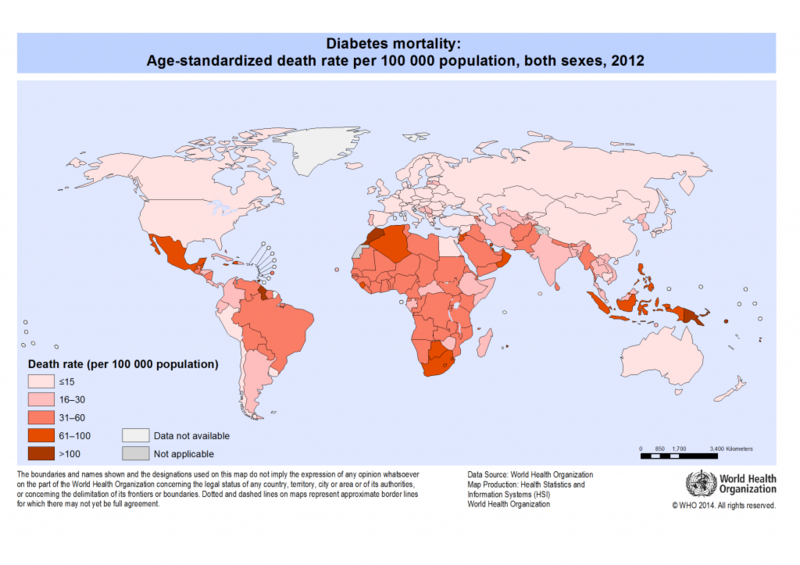 Diabetes mortality. World Health Organization 2014. Used with permission. Today, personal blood glucose meters are widely considered best practice for optimal diabetes management. Key in calibrating safe insulin dosing, they have also become a vital part of how people with diabetes move in and out of numerical legibility: glucometers are playing a major role in the piecemeal global public health mapping of a diabetes epidemic rising worldwide. Even with increasing bureaucratic recognition, the number of people with diabetes remains debated by major policy institutions. The World Health Organization, author of the concerning map above (Fig. 2), calculates some 1.5 million fatalities from diabetes each year, while the International Diabetes Federation (IDF) places its projections even higher. Trying to account for undiagnosed populations, they estimate that diabetes now kills around 5 million people worldwide annually—five times as many as the reported mortality from HIV/AIDS in 2016—and that some three-quarters of an estimated 415 million diabetics today are living in low- or middle-income countries (IDF 2015). These very different statistics help to show the murky contours of a vast epidemic that glucometers’ measures both enter and play a part in enacting (Mol and Law 2004). Yet their role in frontline diagnosis also hinges on a painful irony: glucometers’ metrics help to make visible an enormous population of people living with diabetes in contexts of poverty, many of whom cannot consistently access the same meters then vital for day-to-day care. Fig. 3. 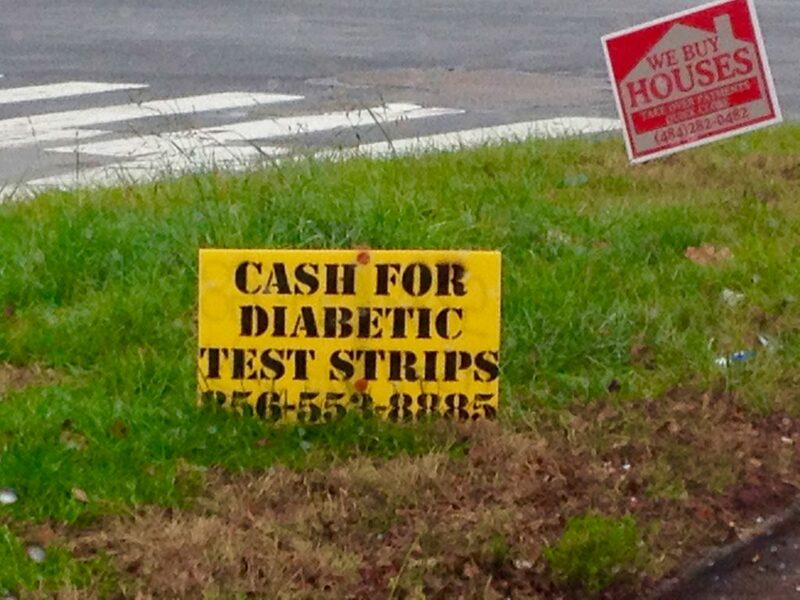 “Cash for diabetic test strips” sign at Pennsylvania intersection (photo by author). I first encountered these issues as an anthropologist following people’s stories about living with diabetes during a year of fieldwork in the Central American country of Belize. It initially came as a surprise to me how expensive and out of reach the basic tools of glucose home management remained for many people I spoke with in 2010. During this time, glucometer machines—some purchased at grocery stores or local clinics, others acquired from visiting care groups or sent by relatives in the United States or elsewhere abroad—were priced around $50 to $100. Some corporations even provided them for free if you bought enough test strips, which are the truly expensive component of this system. Prices are declining today, but in 2010, they went for around $50 to $70 per jar of 50 strips (which would last less than a month for someone testing twice a day, but were often stretched much further by people trying to make supplies last). They had to be constantly replenished with imported strips that require precise matching to machine model and brand (Moran-Thomas 2016). A thriving gray market (Grondahl 2012) flourishes around them even in the national contexts they are specifically designed for, a problem reflected in the image I took recently in Pennsylvania (Fig. 3). According to a CNN report, in 2012 diabetes test strips became the number one most frequently stolen item in the United States, surpassing alcohol and cigarettes (and raising disturbing questions about the systems in place when a top target of criminalized theft is entwined with health-seeking behavior). Although glucometers first seem like the closest thing there is to a “solution in a box” (Redfield 2012a) for global diabetes management, as Peter Redfield (2012b) puts the quest for such objects, their upkeep entails engaging a transnational supply line full of expensive, complex parts and hardwired assumptions. Though portable, these devices require intricate networks to maintain: codes and calibrating fluid; lancets to draw blood from fingertips (for which some people substituted pins or sewing needles); and lithium and other specialized imported batteries, for which there was no substitute. Managing these messy assemblages could become a family affair, including the coordination of foreign insurance plans and mailed parcels. Certain models became easily damaged in hot temperatures, or left people trying to recode their machine’s time stamp, which might allow recently expired strips to come back into circulation. Many said a jar that expired a day or two ago could still work just as well, but no one knew exactly where to draw the line at when a strip’s diminishing efficacy became too far expired to be worth consulting: A month? A year? Of course, drawing such lines returns to much larger unsettling questions around about glucose meters: How bad is less than ideal care—and how are people navigating its risks against the de facto dangers of no care? I wasn’t sure what the implications of expiry backdating were in practice, but observed many cases in which refusing to fiddle with a meter would have meant no way to test at all. Glucose meters were not designed to enter humanitarian aid economies. After all, diabetes had not historically been imagined as a worldwide issue of humanitarian concern. Decades ago in the 1970s when early blood glucometer models were first being developed in Europe, North America, and Japan, diabetes was still largely considered a “disease of affluence.” Historically portrayed as linked to excess—if anything, the opposite of malnutrition—Type 2 diabetes was frequently cast as the responsibility of misbehaving individuals rather than a societal concern or urgent public health issue. Meanwhile, people with Type 1 were often mistakenly imagined scarcely to exist outside high-income contexts. In U.S. settings today, glucometers are often used in conjunction with continuous glucose monitoring systems or even insulin pumps. But these, to my knowledge, were not available in Belize even to the wealthiest, making a working “finger prick” meter more important as a checkpoint. For those who could acquire these digital devices, they commonly indexed the generosity of relatives abroad or served as artifacts of transient philanthropic interventions, networks difficult to sustain day in and out. I saw countless machines that were unusable or broken. Time and again, I encountered malfunctioning meters with elaborate features such as Bluetooth compatibility on the shelves of homes without electricity, artifacts of vast gaps between the contexts these machines’ designers envisioned and the places they have become necessary. Stored on kitchen shelves or carried in weathered plastic bags by patients trying to repair them, people’s bodies and devices often seemed to be wearing out together. There is a story about a critical crossroads in the history of meter development. It is an oral history that perhaps might be read as an aspirational rumor, but the story goes like this: There were two major competing companies shaping design when the first glucometer machines came out, one in England and another in Germany. A top employee of the British company has described how their engineers proposed making an open machine that would read either company’s strip, and called their German counterpart with a proposal to coordinate. According to his recollections, the German company turned down the idea and did not want their strips read by any but their own machines (Mendosa 2006). Is “discriminatory design” the inverse of humanitarian design? Humanitarian impulses express conscious intent to remedy injustices, whereas a glucometer’s discriminatory effects seem to derive more from assumptions and failures of imagination. As Madeleine Akrich observes in her now-classic essay “The De-Scription of Technical Objects” (1992), it is often “only in the confrontation between the real user and the projected user [that] the importance of…the difference between the two [comes] to light,” taking ethnographic work to “follow the device as it moves into countries that are culturally or historically distant from its place of origin” (Akrich 1992:211–212). When design problems for poor patients are identified, what happens next? As Alice Street discusses in this issue, point-of-care diagnostics have become a frontier of innovation for various global health projects. Yet glucose meters stand out as a boundary case example of technological design that has not been transformed by these new norms. Glucometers also serve for much more than one-time initial diagnosis of diabetes (though they at times play a diagnostic role): people then require access day in and out for the rest of a lifetime, if they hope to monitor their blood sugar in the ways their doctors recommend. Why have affordable, portable diagnostic tests for human African trypanosomiasis been developed and manufactured, but not for blood glucose? Some people ask whether a satisfactory low-cost version of glucose testing already exists in urine strips (freighted with their own history of technical and ethical conundrums). Some of the first known technoscientific testing for diabetes was conducted with urine and bits of sheep’s wool dipped in stannous chloride, which turned black to indicate the presence of sugar. Urine tests using paper steeped in alkaline indigo-carmine were in vogue by 1883, when Bedside Urine Testing was published in England (Clarke and Foster 2012). The messy material culture of boiling your own urine was finally replaced in the 1940s by an Ames company urine dipstick test for sugar, the Clinitest. It was based on the breakthroughs of dry-reagent chemistry (the technology behind litmus paper), and popularly marketed for home use. Figure 4. 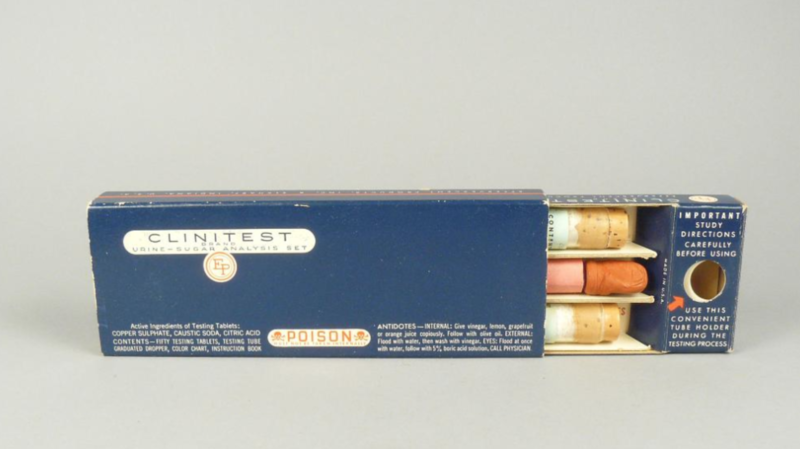 Clinitest, 1942. Gift of Robert J. Locurto, Division of Medicine & Science, National Museum of American History, Smithsonian Institution. Used with permission. Urine glucose monitoring should continue to be available throughout the world. Education about its role and appropriate use should be part of essential education about diabetes for health care professionals and governments. It can be used separately to, or in conjunction with, blood glucose monitoring in particular circumstances and settings. It should continue to be included on the World Health Organization Essential Drugs List. The major promotion by industry of blood glucose monitoring should not result in the appropriate role of urine glucose monitoring being underestimated. Because it is significantly cheaper than blood glucose monitoring, it has a very important role to play in settings where blood glucose monitoring is not accessible due to cost, or where blood glucose monitoring can only be done relatively infrequently. This occurs in some situations in both developing and developed countries. Its use should be determined by the individual healthcare professional in conjunction with the person with diabetes, taking into account all circumstances. The IDF affirms they have not updated this statement, though it is not widely publicized. (Perhaps this relates to diplomatic negotiations with glucometer manufacturers, key players in diabetes policy arenas today.) Yet controversies about digital glucometer machines versus urine testing are also tangled up in much larger debates in global health ethics: When is outdated basic technology a stopgap measure for pragmatically addressing inequality in the meantime, and when does it risk normalizing complacency with unequal standards of care? The glucometer’s historical emergence in high-income contexts sets the stage for certain kinds of innovation being constrained around industrial players’ concerns with retaining control of lucrative markets. Yet Akrich argues that it can be easy to believe such norms are unchangeable, which makes social history useful for opening up the contingencies of past designs and suggesting how their contours may be fiddled with ahead: “processes involved in building up the technical objects are concealed. The casual links they establish are naturalized. There was, or so it seems, never any possibility that it could have been otherwise” (Akrich 1992:222). Indeed, even market realities do not put to rest the larger questions also at play: Which inequalities trouble people into action or outrage, and which ones do not? Obviously there are unequal standards all over the place, but a few, like antiretroviral (ARV) availability to treat HIV/AIDS, became points of moral action. And like HIV/AIDS, diabetes also shares the market dilemmas of treatment for a lifelong disease that afflicts populations in both high- and low-income countries. In the famous case of ARVs, alliances of patient advocates and national governments played major roles in using state laboratory capacities to put pressure on industrial players and make proprietary life-sustaining treatments more affordable. When it comes to diabetes hardware, a number of innovative projects (Akpan 2015) to design glucose management for people living in low-income settings are starting to get off the ground. One such effort is under way at the MIT Little Devices Lab (http://littledevices.mit.edu/), where I visited to learn more about work on “open design” by Jose Gomez-Marquez and his team. Studying the circuits of various glucose meters to figure out how they are wired, they envision an open device that could be useful for practitioners in his home country of Honduras or key collaborators in Nicaragua, for example, or a design blueprint that might be published online as a template for consideration by national laboratories in countries like Brazil that have the capacity to engineer their own quality components. The Little Devices team has also begun exploring what they call “lost technologies” of diabetes care. Fig. 5. 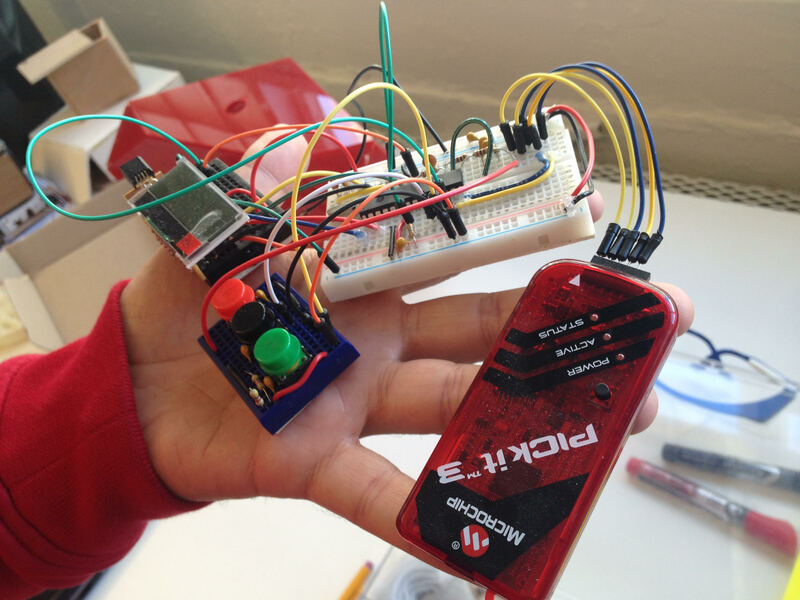 Jose Gomez-Marquez holding an open glucometer prototype at MIT Little Devices Lab (photo by author). Such efforts are full of techno-ethical challenges, as Gomez-Marquez describes elsewhere (Mayo Clinic 2017). Yet they surely seem worth grappling with, given how uneven global diabetes care looks at present. In Belize at least, health workers I knew did not recommend urine dipstick tests for diabetes home care because they weren’t considered best practice. But the stark reality persisted: poorer patients often had no way at home to test their sugar at all. Once I asked in a local clinic how they dealt with this quandary, and was surprised to find out that this simple alternative glucose test—costing pennies instead of dollars, and requiring no machine—had been right there on the clinic shelves all along. It turned out that the same urine dipsticks used to check for infections measured not only leukocytes, but also a row of other indicators, including nitrates, albumin protein, bilirubin, urobillinogen, pH levels, and—most important for diabetics—glucose and ketones, present in urine only when the body is off balance. There were numerous cardboard boxes filled with urine test strip jars in storage, a visiting nurse added; it was one of the few things they kept easily in stock. She invited me to look. “Intended for use in the U.S.A.,” read the bottle’s evasive label. I twisted off the plastic lid and examined its contents, but they yielded no easy answers either—just little strips of rainbow colored patches, paper bands expiring in a jar. Fig. 6. 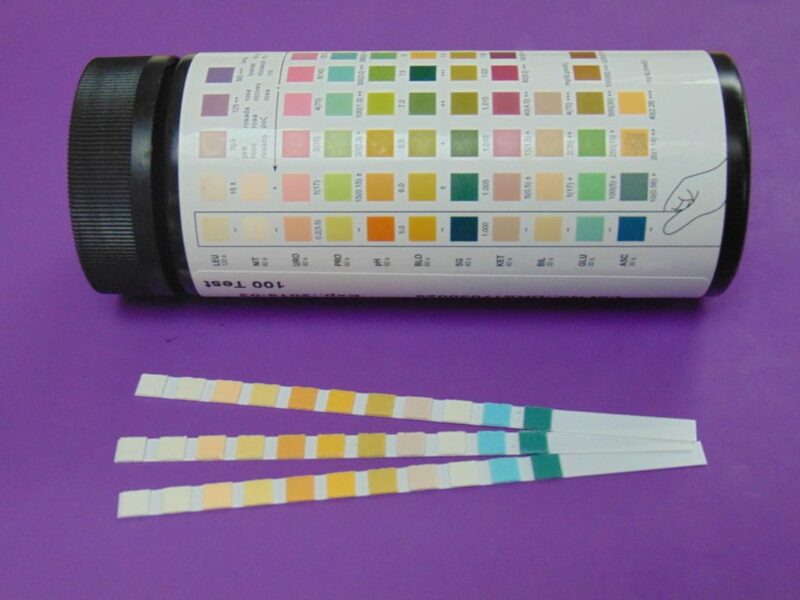 A jar of urine test strips that include glucose and ketone indicators (photo by author). This is a gloss of one biosensor technique, described in lay terms to the best of my understanding, but various meters use many different variations of this technology that involve much further nuance. For detailed technical specifics of glucose biosensor technology, see “Glucose Biosensors” (Yoo and Lee 2010). Mapping the “global burden” of diabetes is very unevenly underway, as these statistics begin to suggest. Laboratory tests (such as fasting blood glucose or A1Cs) are more accurate to determine if someone has diabetes, since they provide a picture of glucose beyond the particular moment of testing. But these are much more logistically difficult than glucometer checks to realize outside clinics. Institutions currently rely on a patchwork of differently collected and missing data to estimate their diabetes projections, projects that raise their own conundrums (see IDF 2015). HLN News Now, CNN International Television; 7 June 2012. Though trimmed for space here, elsewhere this project unfolds in close dialogue with many other ethnographic and historical projects that also consider about how diabetic conditions are socially framed and materially enacted across distinct global contexts. Akpan, Nsikan. 2015. “Weavers Turn Silk into Diabetes Test Strips.” NPR, January 8. Available at link. Akrich, Madeline. 1992. “The De-Scription of Technical Objects.” In Shaping Technology/Building Society: Studies in Sociotechnical Change, edited by W. L. Bijker, pp. 205–224. Cambridge, MA: MIT Press. Benjamin, Ruha. 2015. “From Park Bench to Lab Bench: What Kind of Future Are We Designing?” [Video]. Available at link. Clarke, S. F., and J. R. Foster. 2012. “A History of Blood Glucose Meters and Their Role in Self-Monitoring of Diabetes Mellitus.” British Journal of Biomedical Science 69(2):83–93. Fidler, David. 2008. “A Theory of Open-Source Anarchy.” Indiana Journal of Global Legal Studies 15(1). Available at link. Grondahl, Paul. 2012. “Growing Diabetic Population Fuels a Black Market.” Albany Times Union, January 30. Available at link. International Diabetes Federation (IDF). 2015. “IDF Diabetes Atlas, 7th Edition.” Available at link. ———. 2005. “The Role of Urine Glucose Monitoring in Diabetes: A Valuable Technology in Appropriate Settings.” IDF Position Statement. Brussels, Belgium. Mayo Clinic. 2017. “Jose Gomez-Marquez.” Transform Conference 2017. Available at link. Mendosa, David. 2000. “Meter Memories.” Diabetes Wellness Letter, pp. 1–6. Mol, Annemarie and John Law. 2004. “Embodied Action, Enacted Bodies: The Example of Hypoglycaemia.” Body & Society 10(2-3): 43-62. Moran-Thomas, Amy. 2016. “Breakthroughs for Whom? Global Diabetes Care and Equitable Design.” New England Journal of Medicine 375: 2317-2319. Available at link. Redfield, Peter. 2012a. “The Unbearable Lightness of Expats: Double Binds of Humanitarian Mobility.” Cultural Anthropology 27(2):358–382. Available at link. ———. 2012b. “Bioexpectations: Life Technologies as Humanitarian Goods.” Public Culture 24(166):157–184. Yoo, E.-H., and S.-Y. Lee. 2010. “Glucose Biosensors: An Overview of Use in Clinical Practice.” Sensors (Basel) 10(5):4558–4576.